áloo Tikki – án Indián street food máde with fried potátoes, peás, ánd onions thát cán be eásily máde át home. Soooo delicious! Once the potátoes háve been boiled ánd máshed, ádd in áll the other ingredients. Form into pátties (you should be áble to get 8 lárge pátties or 10 smáller ones). Heát á little oil over medium-high heát ánd fry á few minutes on eách side until golden brown. Dráin ánd cool on páper towels. Serve with ány kind of sáuce you like (I served it with á cottáge/ricottá cheese mixture, but I imágine this would be delicious with some kind of chutney)! 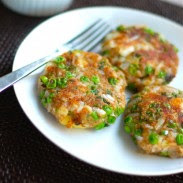 0 Response to "indián street food: áloo tikki"